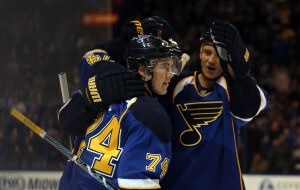 The Blues have won three in a row and eight of their past nine (8-0-1). They haven’t lost in regulation this month. They became the first team to reach 100 points this season with their 3-1 win against the Winnipeg Jets on Monday. Tonight, they go for their fourth victory of the season over the Blackhawks in a game at the United Center in Chicago. With a victory tonight, the Blues can clinch a playoff spot, but at this point their sights are set even higher, as the front runner for the President’s Trophy. Only six players participated in a voluntary skate on Tuesday. T.J. Oshie, who’s fiance gave first to the couple’s first child, a daugther, made the trip and will play tonight. Blues center David Backes scored twice Monday and has a three-game point streak (two goals, two assists). Backes also has two goals and two assists against the Hawks in a four-game points streak. Ryan Miller is 7-0-1 and is the first Blues goaltender to record points in his first eight starts. He has a 1.61 goals-against average and a .933 save-percentage since joining the Blues. Game time is 7 p.m. tonight.